Thanks to a changing climate, production of fruits and vegetables may be more challenging in some regions of the country in the future. To help ensure tomorrow’s fruits and vegetables, researchers with the WSU Center for Sustaining Agriculture and Natural Resources (CSANR) and Department of Biological Systems Engineering are on a four-year, $3.4 million research project to find more places to grow produce, led by the University of Florida. 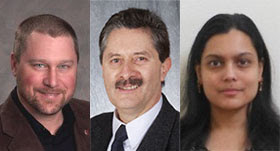 At WSU, Chad Kruger, director of CSANR; Claudio Stöckle, Biological Systems Engineering professor; and Kirti Rajagopalan, assistant research professor with CSANR, received more than $490,000 from the U.S. Department of Agriculture’s National Institute of Food and Agriculture.